The city of Florence is unusually rich with history and beautiful works of art. A short list of its endless marvels is necessarily incomplete. We, at B&B Casa di Barbano, are always ready to suggest more for the inquiring traveler. Sunset at Piazzale Michelangelo: The warm rays of light from the Italian sun low in the sky illuminate the magnificent panorama of Florence and bounce off the river Arno in a spectacular feast for the eyes. The Accademia Museum: There is no sculpture as magical as Michelangelo’s David chiseled from white marble and accompanied by Michelangelo’s “slave” sculptures. They need to be seen in person in the Accademia museum. 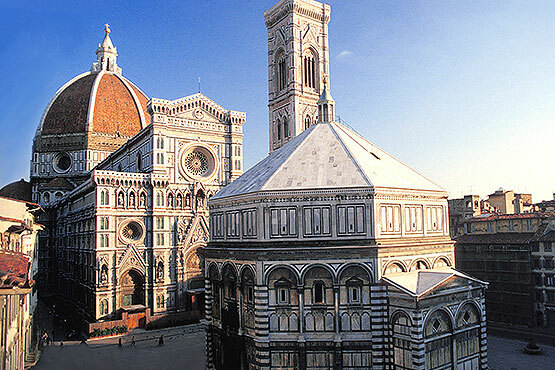 Filippo Brunelleschi was an architectural genius. It is exciting to actually walk inside one of his greatest masterpieces – the Cupola (or Dome) of the Duomo. At the end one is on top of this elegant structure looking down on the characteristic brick rooftops all over Florence. The Uffizi Gallery has so many masterpieces by such great artists as Giotto, Botticelli, Michelangelo, Leonardo da Vinci, Caravaggio, Raphael, and Titian, that it is best to visit more than once. The exhibit is arranged chronologically, however, so it is also easy to admire just the paintings one is most interested in. 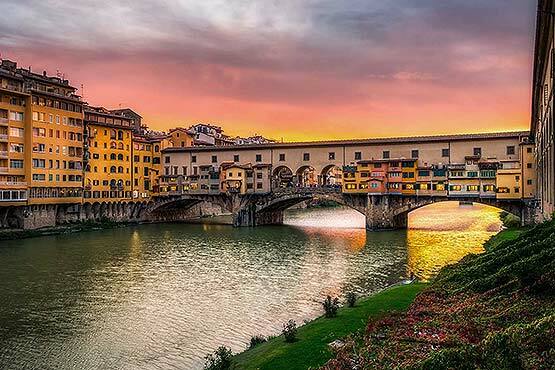 A romantic stroll along the Arno River from the unique Ponte Vecchio, with its enticing gold shops, to the Piazza Poggi is a refreshing break from the great museums in Florence. This is the best, and most scenic, tract along the river and it is also home to some good restaurants. The San Lorenzo Church is an ensemble of great architecture. The basilica and Old Sacristy are quintessential Renaissance masterpieces by Brunelleschi. The famous Laurentian Library by Michelangelo features the best designed steps in history. The New Sacristy is Michelangelo’s response to Brunelleschi and is home to many of his best sculptures. The Galileo Museum is a little known treasure of hand wrought scientific instruments that played a fundamental role in the history of scientific discovery. Florence also offers graceful classical music and opera in many enchanting revenues such as the historical Pergola Theater, the Bargello Museum, the church of St. Mark’s, and even the Natural History museum of Florence. A great concert in an extraordinary setting is a perfect way to end a day.